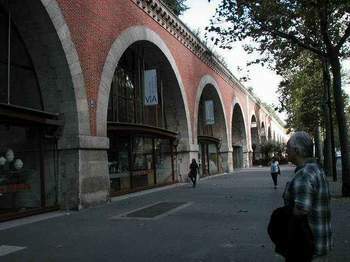 Tom gapes at the long row of 'ateliers' (workshops) and galleries under the Viaduc des Arts in the 12th arrondissement. We started walking from the Opéra Bastille down the rue Lyon to avenue Daumesnil and VOILA! There they were. 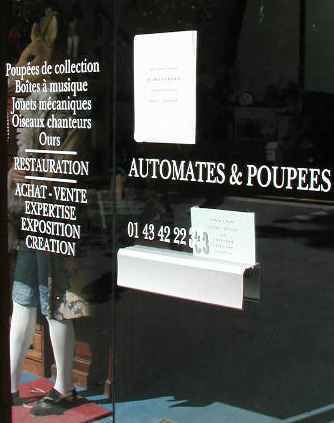 Here's a typical atelier in the viaduc. Notice you can see straight through, and this give the artists and craftspersons lots of light to work with. 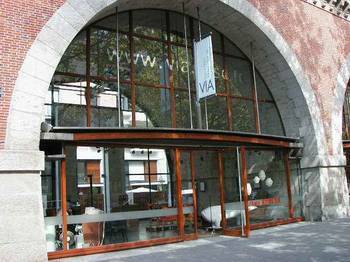 Many of the spaces are real workshops, and some are really for retail, and some are a bit of both. Some workshops make offbeat furniture, like this one. 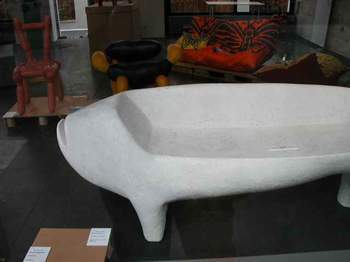 The large white thing is a bench sculpted out of something in the form a fish -- an article of furniture called a "banc de poisson." 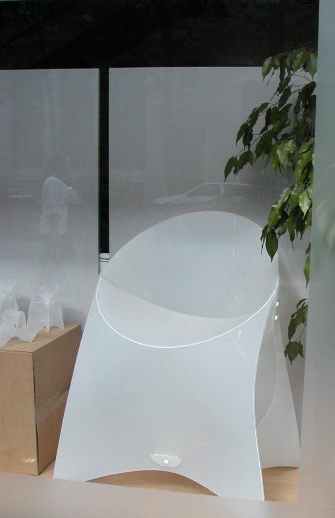 This workshop makes ultramodern plastic furniture like the chair in its front window. Next to the chair was a table with lots of miniature chairs and other kinds of furniture. I guess these were little models for big ones to come. Some workshops are dedicated to restoring old things. 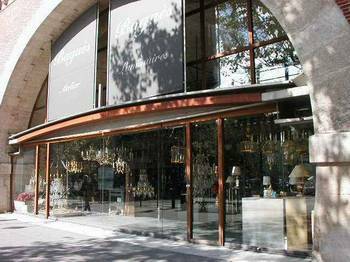 This one restores beautiful old chandeliers, and it looks like they sell some new lamps, too. 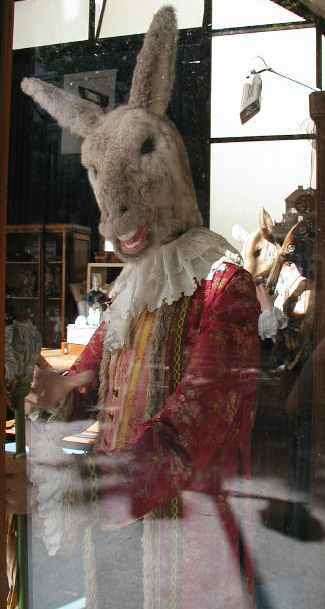 This place restores old puppets, including life-sized ones like these donkeys in old fashioned formal garments. On top of the viaduct is a long, landscaped promenade that must be a mile and a half or two miles long. We eventually climbed the steps and walked to the end of it, where we visited the Jardin de Reuilly. Then we turned back and walked the full length, back to Bastille to take the Métro home again. The entire, very long walk was utterly enchanting. The viaduct appears to have been the site of an elevated train at one time. 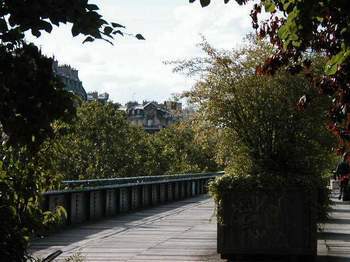 This is one of its old wooden bridges, now part of the "Promenade Plantée." The Promenade Plantée has lovely views of the street scenes below, with lots of charming old buildings and bricked or cobblestoned neighborhood avenues and alleys. But there are new buildings in the 12th arrondissement, too. As a whole, they are better designed and fit in much better with the existing streetscape than the newer buildings of the 19th. 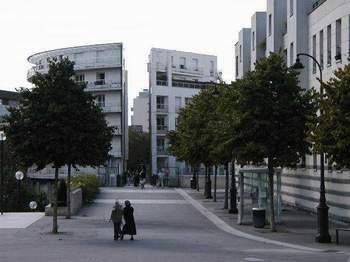 Look how the Promenade cuts right through the modern apartment building straight ahead. Very clever. 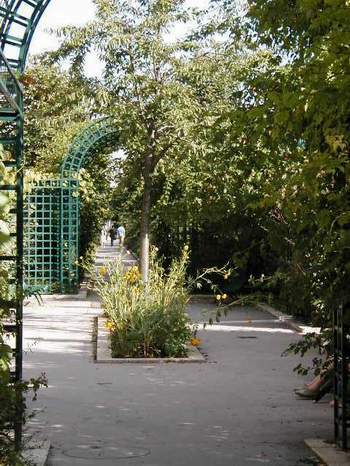 On to the Jardin de Reuilly . . .